Francesca’s restaurant was known as a fine dining restaurant. Located on the crystal waters of Havannah Harbour 35 minutes from town meant that there were some transport challenges in attracting guests from Port Vila. Along with the client, we felt that the business would benefit from encouraging guests to stay the full day and thus the drive out was justified by the use of the beautiful environment for longer. Pandanus’ work for Francesca’s was a branding refresh and modernization and included the creation of the new ‘Beach Club’ concept encouraging diners to stay and play on the beautiful beach and crystal waters. 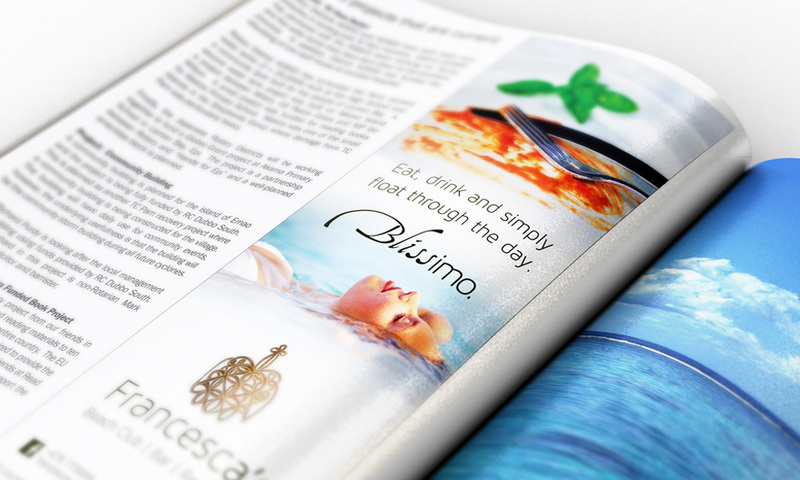 The images used in advertising are suggestive of the ‘Beach Club’ concept and remind people that this is more than a restaurant, it’s an experience. We also created the ‘Blissimo’ tagline which echos the Italian bones of the establishment and can be used to describe the food, the atmosphere, the experience and more..